This stunning Victorian collarette has been crafted in 12 ct yellow gold with silver settings. The necklace has an organic scrolling link and swag design accented with a feature articulated drop. 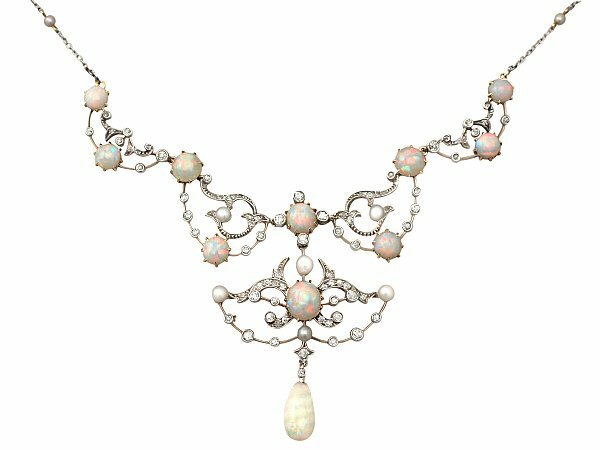 Ten cabochon opals embellish this impressive collarette, with a bead opal ornamenting the feature drop. The shaped, scrolling settings and swags display a total of eighty-six, well colour matched, collet and pavé set, Old European and Dutch cut diamonds of various sizes. 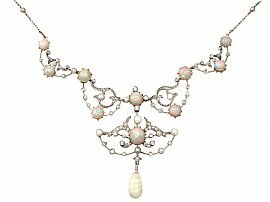 This stunning, original diamond and opal collarette is further accented with six 4mm pearls to the three most central frames, and six 3mm pearls incorporated into the platinum trace chain. The necklace secures to the reverse with a push fit barrel clasp. This impressive collarette is supplied with an independent diamond grading report card and is fitted to the original hinged leatherette presentation case. The satin and velvet lined interior of the case displays the retailer's mark 'John Dyson & Sons, Makers to the Admiralty, Watchmakers and Jewellers, 24,25 & 26 Briggate, Leeds'. This stunning example of Victorian craftsmanship is exceptional quality, set with eighty-six very high colour graded, very well colour matched, old cut diamonds, natural opals and pearls. The collarette is a very good gauge of gold and in excellent condition. Total length of collarette 39cm/15.35"
Length across embellished links//settings 12.4cm/4.8"
Length of central drop 6cm/2.36"